Diane Thomson recently made a bold move. She ditched her cellphone plan for good. She still makes calls with her iPhone, but no longer pays a telecom $100 a month for the service. Instead, the 59-year-old retired nurse uses a no-cost mobile app called Fongo. With Fongo, Thomson gets free voicemail and call display, and there's also no charge for calling in Canada. She just needs Wi-Fi access. "It's amazing," reports Thomson, speaking to CBC News from her home in Powassan, Ont., using her Fongo app. "I can call my family back in Nova Scotia for free." She says she's tried to convince her friends to sign up, but many people just don't get it. "They think once their [telecom] provider is removed from the phone, the phone's useless. They don't realize, as soon as you hit that app, you can talk." A growing number of mobile apps on the market now offer low-cost or free phone service that works using the internet. The apps aren't for everyone, especially for consumers desiring simple and seamless phone service. But for those willing to make the extra effort and contend with a few hiccups, the apps could drastically cut down or even eliminate your cellphone bill. "If you're vigilant about using them in a certain way, they can be useful to you," says Daniel Bader, senior editor with the tech site Mobile Nations. 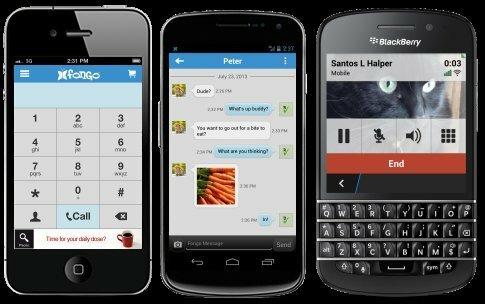 Waterloo, Ont., companies Fongo and TextNow both offer mobile phone apps with many free features. The apps work using your Wi-Fi access or data connection. To get calling, simply download either app at no charge and sign up. You will immediately get a phone number and access to voicemail service — for free. Countrywide calls with both services are also free. TextNow also offers free texting in Canada and the U.S. plus free phone calls to the States. Fongo charges $1.99 a month for texting. Both services have low-cost long-distance deals. For example, Thomson pays two cents a minute to call family in Ireland. Fongo customers can also transfer their current phone number for a one-time fee of $25. And if you're not ready to give up your current mobile plan, you can still download either app as a secondary service on your phone to avoid draining your talk minutes. Besides Wi-Fi, the app will also work using your phone's data plan. By now, you're probably thinking there's a catch. "It's completely legal. There is no catch," says Greg Dalton, president of Fongo. "It's just new technology." Both Fongo and TextNow make most of their money by displaying small ads on the phone's screen. They do not appear to be obtrusive. So why isn't everyone using one of these mobile apps to cut down their bills? Canadians are famously known for complaining about the cost of their mobile phone service — we pay some of the highest rates in the industrialized world. Fongo reports that it has 400,000 active users. TextNow has around 6.5 million mobile app customers — however, 97 per cent of them are American. "For some reason, Canada is a little slower to catch on," says Derek Ting, CEO of TextNow. He admits the small uptake in Canada of his product leaves him scratching his head. "As long as your internet connection is solid, it should be as reliable as a [telecom's] phone service." But there's the catch — obviously, you need Wi-Fi access or a data connection. When using Wi-Fi, a weak or spotty connection could lead to diminished or temporarily dead service. CBC News tried Fongo and TextNow using Wi-Fi. With both apps, the setup was quick and easy and the voice quality was good. But the audio cut out occasionally during phone calls with both services. Thomson reports sometimes a call goes straight to voicemail even when she has Wi-Fi access. But she claims her Fongo service has no more hiccups than her previous cellular plan with a major telecom. Thomson has also found a way to always have phone service. She pays $25 a month for a portable wireless internet device from one of the telecoms. The device allows her to get internet access no matter where she is. "I haven't been in an area where I can't call," she reports. Even with the added expense, Thomson points out, she's still paying $75 less a month compared with her previous cellular plan. But tech analyst Bader says not everyone is interested in adopting workarounds to turn a free mobile app into something equivalent to traditional cell service. "The vast majority of people who would take advantage of a service like this don't see price trumping the convenience of having a data and regular phone plan," he says. Yes, you can use the app in conjunction with your current cellular service, but that requires juggling two different phone numbers and two separate formats for making and receiving calls. "It adds a layer of complexity that people don't want to deal with," Bader says. So even though it may save you cash, the mobile phone app isn't for everyone. Sometimes it's just easier to stick with an all-inclusive cellular deal, no matter the cost. But Thomson is happy she made the move and says there's no looking back. "It's just like having a regular cellphone plan, except it's a lot cheaper."